Navigating large-size event prepares students to stand out as future professionals. Columbia, Mo. 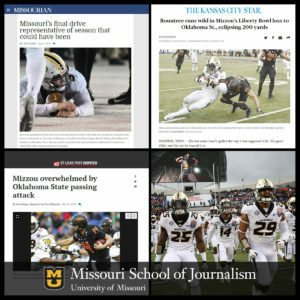 (Jan. 16,2019) — The Missouri Tigers football team went bowling at the end of the 2018 season and so did 10 students from the Missouri School of Journalism. Mizzou played Oklahoma State University on New Year’s Eve in the Liberty Bowl. Eight students provided multi-day coverage in Memphis, Tennessee, for the community newspaper Columbia Missourian and NBC affilate KOMU-TV. Two sports interns covered the game for the state’s two largest newspapers. Road trips are a semi-regular feature of a Missouri Method approach to preparing for a career in journalism. Last month, 10 students from the University of Missouri traveled to Memphis to help provide media coverage of the Liberty Bowl held on New Year’s Eve. Photojournalism students Nate Brown, Jay Bury, Jessi Dodge and Julia Hansen provided images for the Columbia Missourian. Dodge also served as the onsite photo editor. “After covering the team last year as a photographer and then again this year as a photo editor, the bowl isn’t just the goal for the [football] team but our team, too,” said Dodge. Eli Lederman and Joe Noser reported on the game and festivities for the Missourian. Andrew Carlson and Edward Redler covered the game for KOMU-TV. Missourian Sports Editor Michael Knisley believes the Liberty Bowl experience, due to its size and scope, is why the Missouri Method is so valuable. Journalism students Peter Baugh and Anne Rogers covered the Liberty Bowl for The Kansas City Star and St. Louis Post-Dispatch, respectively. Both are sports interns who reported on Mizzou football for their metro dailies during the regular season.